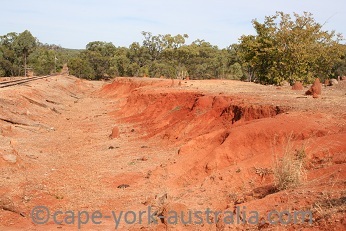 Cape York geology is all about poor soils and a very old landscape. Australia was geologically active when it still belonged to the supercontinent Gondwana. But since it separated from Gondwanaland and started drifting northwards, it became a very inactive continent when it comes to geology. Far away from the continental plate margins, it hasn't had any active volcanoes or massive earthquakes for quite a while - since the building of the Great Dividing Range - the mountain range that follows the whole east coast of Australia, and is the only mountainous part of Australia - the rest of the continent is pretty flat land. The reason for this flatness is its geological inactivity - it has given erosion a lot of time to flatten all the ancient mountain ranges, and no new ones have been built. This is also why you find so many amazing, old and strange rock formations in Australia - they have all been uncovered by long-time erosion, and no geological processes have been there to destroy them. 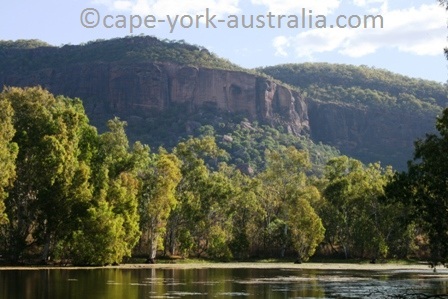 Cape York hasn't got any really famous rock formations (Mount Mulligan is one of the most impressive), but some interesting geological features that you will come across are black granite boulders, white sand dunes, coloured sands, limestone caves, and the world's largest bauxite deposits. 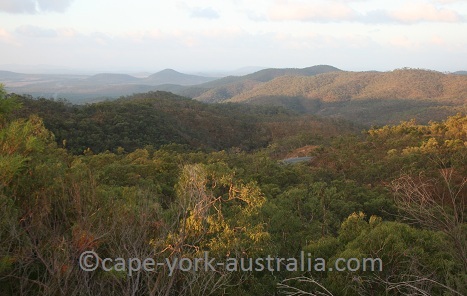 The three distinctive geological regions on Cape York peninsula are the Great Dividing Range; Laura Basin on the eastern coast, and Gulf Basin on the western coast. The Great Dividing Range is Australia's youngest and highest mountain range, and as such it is not high at all by world's standards. It runs all the way from Victoria in the south to the tip of Cape York. You will notice it mostly in the south-eastern parts of the peninsula. While the Great Dividing Range runs roughly along the eastern coast and central east, it is interrupted by Laura Basin - a lowland area around Princess Charlotte Bay. You will notice it in the area around Musgrave, particularly towards and in Lakefield National Park. The third major geological region on the Cape York peninsula is the Gulf Basin. It covers almost the whole western half of the peninsula - from the northernmost tip past Weipa, Pormpuraaw and Kowanyama, and down south to Karumba and Normanton in the Gulf Savannah. 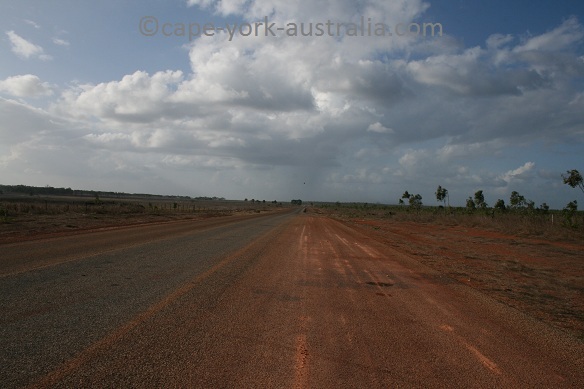 Cape York is well known for its soils that are poor in nutrients - the main reason why large scale development of the peninsula has been impossible - thanks heaven! Much of its soils are beautifully red - and those are the poorest soils. Black soils are generally more fertile. 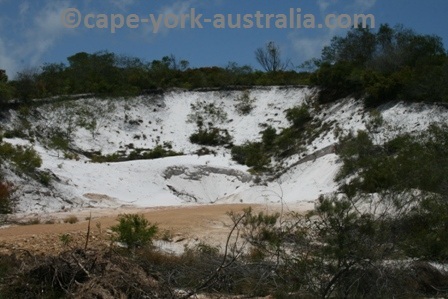 In the south-eastern parts of the peninsula, north of Cooktown, around Cape Flattery and Hopevale, are some extensive sand dunes. Those got here when Australia went through a period of ice ages, and the water levels around it were lower than today. Although historically famous for its gold rushes, there is no gold mining in Cape York today, and neither do we have any opal. 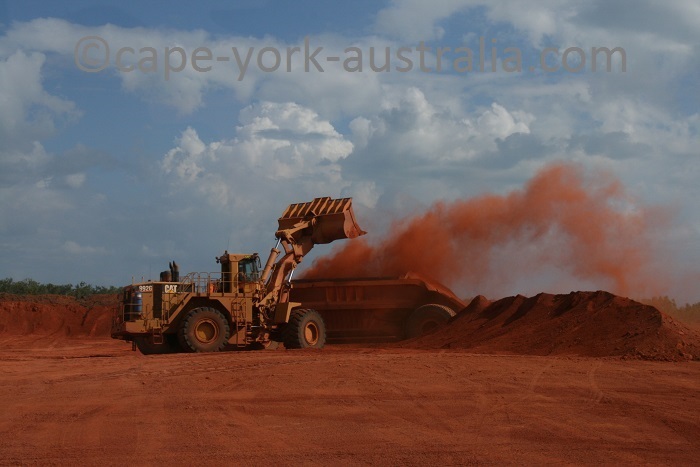 But in the north-western parts of the peninsula, particularly around Weipa, are world's largest bauxite deposits, and there is some extensive bauxite mining. There are also some interesting granite boulders in Cape York. 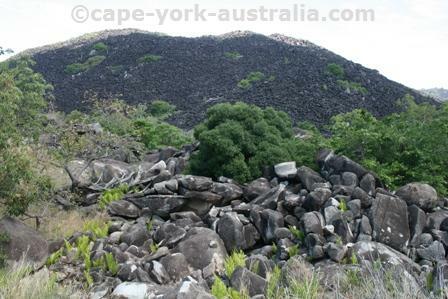 Black Mountain south of Cooktown, and the headland of Cape Melville north-east of Lakefield National Park, consist of heaps of black granite boulders. Granite is not a black rock - the colour comes from an algae. 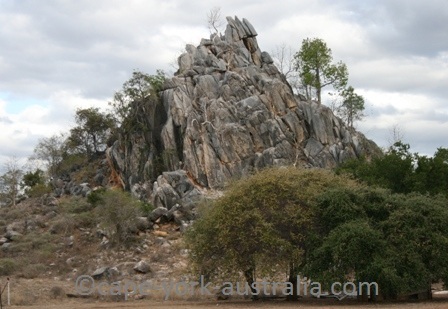 There are also some massive limestone bluffs just south of the peninsula around Chillagoe. Those are the remnants of the Great Barrier Reef about 500 million years ago when the area was the bottom of an inland sea. 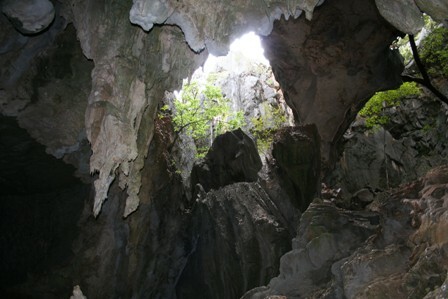 Limestone is a rock that dissolves quite easily - that's how limestone caves are formed, and Chillagoe Caves are a good example. 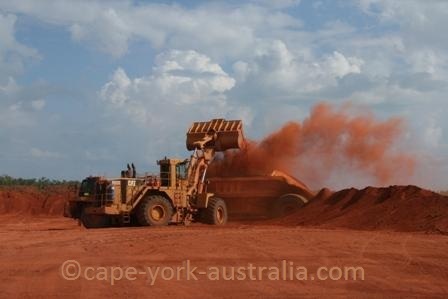 Australia is the world's number one bauxite mining country. 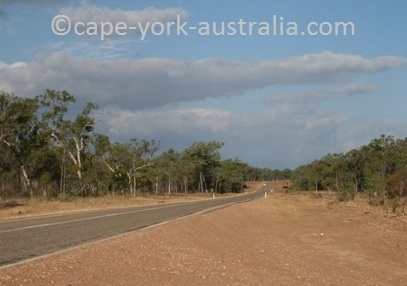 And Cape York has some of the richest deposits in Australia. Weipa would probably not exist without bauxite mining, at least it would not be the place it is. Some new mines have been proposed, the only bad thing is it threatens the habitat of some endemic species such as palm cockatoo. Australia is the world's largest bauxite producer with five mines, six alumina refineries, six primary smelters, and 16 mills. There are three mines in Western Australia - Boddington, Huntly and Willowdale (there are also some deposits in the Kimberley which are so far not mined). But the highest grade deposits are mined at Gove in Northern Territory (UPDATE closed as of January 2014), and Weipa in Queensland. Most Australian deposits are high in silica, which makes refining more costly, but the advantage is that they are shallow and therefore quite easy to mine. All are hosted by aluminium rich laterites, where the main ore bearing mineral is gibbsite. Weipa deposits were first reported as early as in the 1700s, but geologist Harry Evans discovered in 1955 that they were worth mining. In an area about 2500 square kilometres there is about 1.2 billion tonnes of ore. The ore mineral occurs in peaklike (pisolitic) form, and consists of 55% of gibbsite and 14% of boehmite. In 1961 the mining began, and the production has multiplied from 453,365 tonnes in 1964 to 16.3 million (dry product) tonnes in 2009. The Weipa mine is owned by Rio Tinto Alcan. 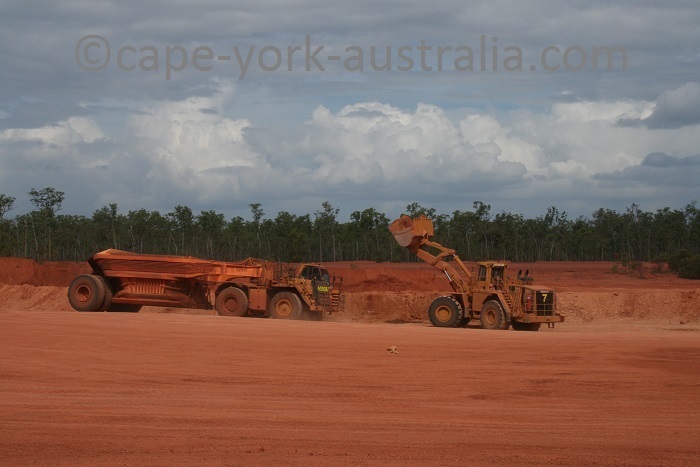 It consists of a few open cut mines where front end loaders extract the ore and load it onto huge trailers which haul the ore to a dump station. At the dump station the ore is loaded onto conveyors and trains, which take it to a plant at Lorim Point. At the plant, the ore is screened and washed before being loaded onto ships that take it to Gladstone on central Queensland coast, where aluminium is extracted from the ore, and some of it exported overseas. After the mining is done the area is revegetated. However it does destroy the habitat for some endemic Cape York species, such as palm cockatoos. The post-mining revegetation sounds good but it does not replace the old growth forests with hollow trees that are necessary for our most iconic bird, found nowhere else in Australia.